Pure pearls having the medicinal properties to cure 22 diseases! These pearls are produced by a farmer! Indeed the farmer has immense power in his hands to secure the mankind. This wonder is the outcome of keen observation and numerous trials of Mr. Sanjay Gandate, progressive farmer. “I was always fascinated with shells since childhood. 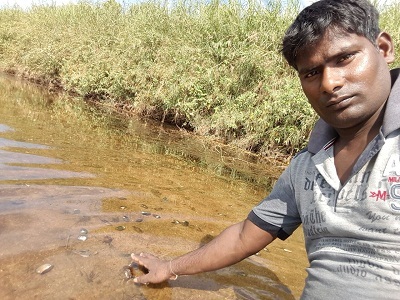 As our farm is located near Wainganga River I used to bring shells at home and observe it minutely. Slowly growing up with all sorts of stories on pearl formation in the oyster it became my passion to cultivate oysters for pearls,” he describes. He is based at Pardi Kupi village, Gadchiroli district, Maharashtra (near Nagpur city). It took years of hard work and patience to understand the natural process and replicate it in the farm pond. The process was standardized in the year 2005. However things didn’t come easy for the farmer! As his village is in naxal-affected region he paid the huge price three times, “I got the success in 2005 but the entire set up was ruined thrice when I was doing pearl farming on the leased ponds. With never-to-give-up attitude I stood up every time. Finally the fourth time I made the pond (10x7x15 feet) in my home so that it can be monitored closely always. Today I am culturing 5000 oysters in my home-pond,” he shares. Mr. Gandate’s experiments revealed that the freshwater pearl is formed when a tiny pebble is inserted inside the oyster and due to the irritation of this foreign substance the oyster releases a sticky chemical. The layers of chemicals keep settling down one over the other on the pebble and the pearl is formed. 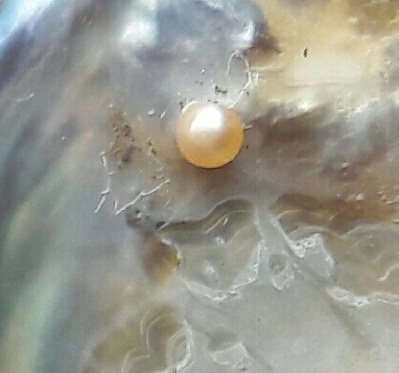 It takes 18-21 months for a pure pearl to be formed and oyster should be alive throughout the process. If the oyster dies the process ends. “The oyster releases the chemical just the way we shed tears if any foreign particle enters our eyes. The process is same,” he explains. The tiny pebble is as small as dot but sturdy enough to withstand the layers of chemical on it and at the same not so big that the oyster dies. “In addition the tiny pebble should be inserted within 30-40 seconds once the oyster is opened else it would die. Thus it requires immense concentration for pebble insertion.” Approximately in the entire production period Rs. 90/oyster is the expense incurred. The time duration of pearl formation varies depending on the soil and water attributes. “If the oysters are collected from salty water and are reared in salty water in the farm pond then the pearl will be formed in 18 months else it will take some more time. It implies the characteristics of environment in which the oyster is born if it is replicated then time taken for pearl formation would be 18 months else it would take additional 2-3 months,” he clarifies. Freshwater oysters are living organisms and extremely delicate therefore it requires food and continuous care. “We drop half kg dried cow dung cakes in the tank once in a month. It is sufficient for 3000 oysters. In addition I have developed a secret medicine that ensures the oyster are always in good health, resistant to diseases and grow steadily. This medicine also proffers a shiny spark to the pearls,” he states. The colour of pond water changes if the oyster dies or gets some infection. It needs to be monitored narrowly. On an average 30% mortality is attained in the entire process. Each oyster produces one pearl. Mr. Gandate sold few original pearls in 2005 to the local goldsmith at Rs. 300-500/piece. “I took the pearls in its natural state to the goldsmith. They knew it is original yet they tested and checked if it is genuine. On getting the affirmative results they bought the pearls from me. Then a long break came because of the damage done by local goons. Now once again I have harvested pearls three months back and sold in Pune at Rs. 2500-3000/piece. The pearl being produced through natural process right from the beginning till the last step, it is found to be rich in medicinal properties that can to cure 22 diseases. Thereby, now it being bought by pharmaceutical and cosmetic industry too,” he reveals. Pearl farming is not time intensive but demands close attention. “I take care of oyster just like small babies. Rest in free time I do traditional farming of paddy and other crops which my father and grandfather used to do,” he shares. Besides he is also pursuing LLB. 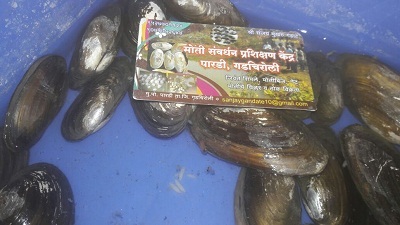 Pearl farming is prospective for the farmers and easy for all to learn and practice. Training workshops are conducted regularly by Mr. Gandate as he wants more and more farmers to change their fortune with pearl culture.